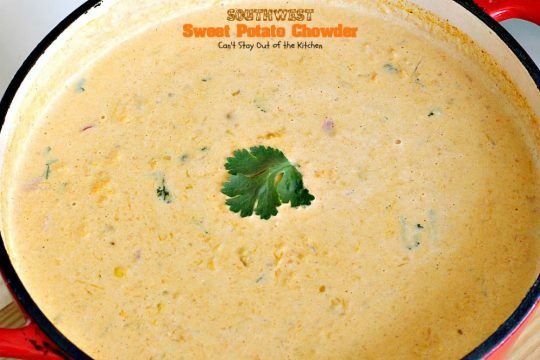 Southwest Sweet Potato Chowder is a delicious, creamy soup that’s the ideal comfort food any time of the year! I admit cheerfully that I’m a sweet potato lover. 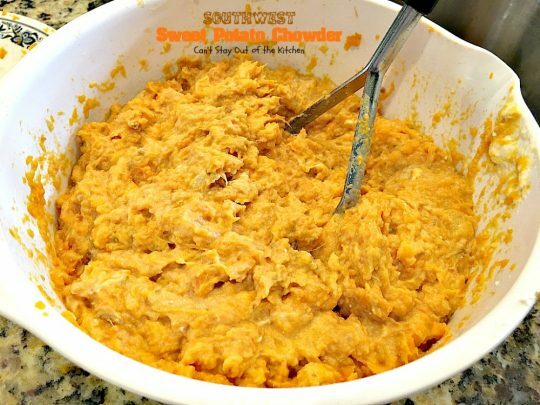 I like anything to do with sweet potatoes and I like them served just about any way you can possibly make them. I will sit down for lunch sometimes and just eat a baked sweet potato with nothing else on it. Sometimes I sprinkle cinnamon on them, but usually I just eat them plain. 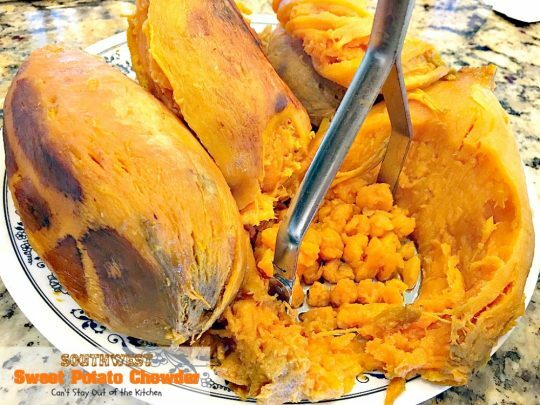 I like sweet potatoes creamed, candied, in casseroles, in soups, in enchiladas, in pies, in muffins, in breads or cornbreads, biscuits or scones, in cakes, for breakfast–like I said, I love sweet potatoes! 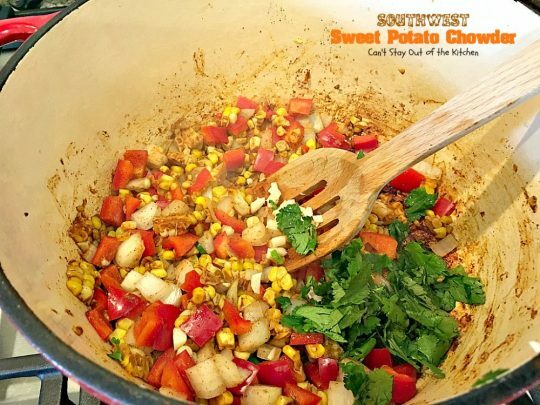 Southwest Sweet Potato Chowder is filled with mashed or creamed sweet potatoes, corn, black beans, and lovely spices like cilantro, chili powder and cumin. Only the sweet potatoes are blended to a smooth texture, the rest of the ingredients add texture and depth to this delicious soup. 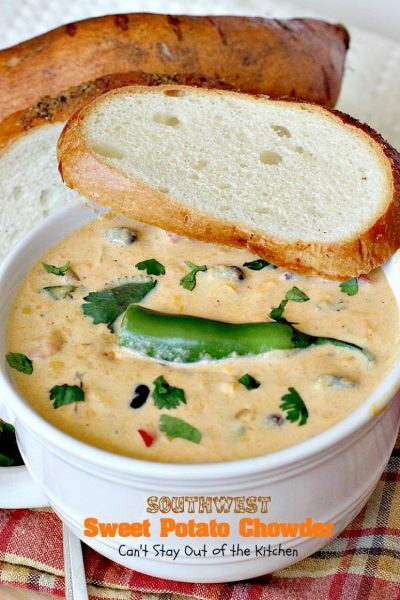 This amazing chowder is smooth with the black beans and corn giving a little crunch and bite to the soup. 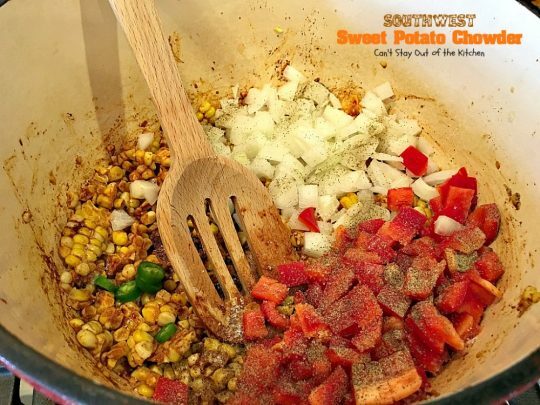 If you’re really into Tex-Mex-style cooking consider adding a can of diced chilies, salsa, or pinto beans to the recipe as well. While I didn’t melt cheese over top of the bowl, adding croutons and cheese and then baking the soup dish a few minutes to melt the cheese would give this soup a wonderful texture and hearty flavor as well. I simply garnished the top of the soup with fresh cilantro. I thought the soup was extraordinarily tasty. Spicy soups are growing on me. For a long time I really didn’t care much for chili (any version), tortilla or taco soups, or hot and sour soups because I just didn’t care to eat spicy soups. As I have been cooking more with cumin, chili powder, turmeric, curry powder, cayenne pepper and other spices I’m finding my palate has expanded and I’m really starting to enjoy having a little heat in soups, stews, or chowders. This recipe is really healthy. Not only is it gluten free, it is not overly high in calories. I used kefir cheese (a yogurt cheese) to cream the sweet potatoes and coconut milk (mine was only 45 calories per 8-oz. glass) to make the chowder type texture conversion from stuffed sweet potatoes. If you do use cream cheese and half-and-half the calorie count will increase. If you are dairy intolerant or vegan there are plenty of substitutes these days at the grocery store to eliminate the yogurt and cheese. This recipe makes a lot, so if you want less leftovers cut the recipe in half or to a third of what’s given. (Although this is really good reheated for lunches). It’s not the kind of recipe that you have to be extremely exact on measurements anyway. Add side veggies and spices to your taste. 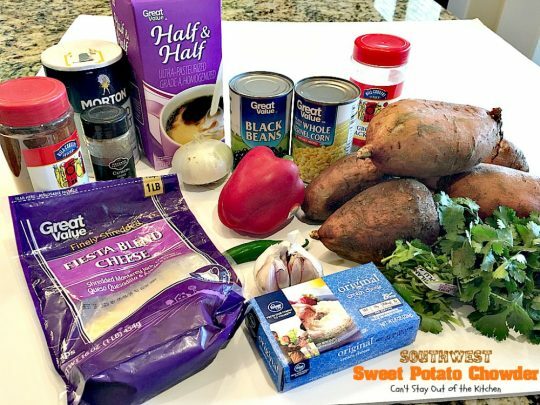 Are you looking for a way to use up sweet potatoes in your garden, or trying to find a way to get your kids to eat more sweet potatoes? Consider offering your family this healthy choice. 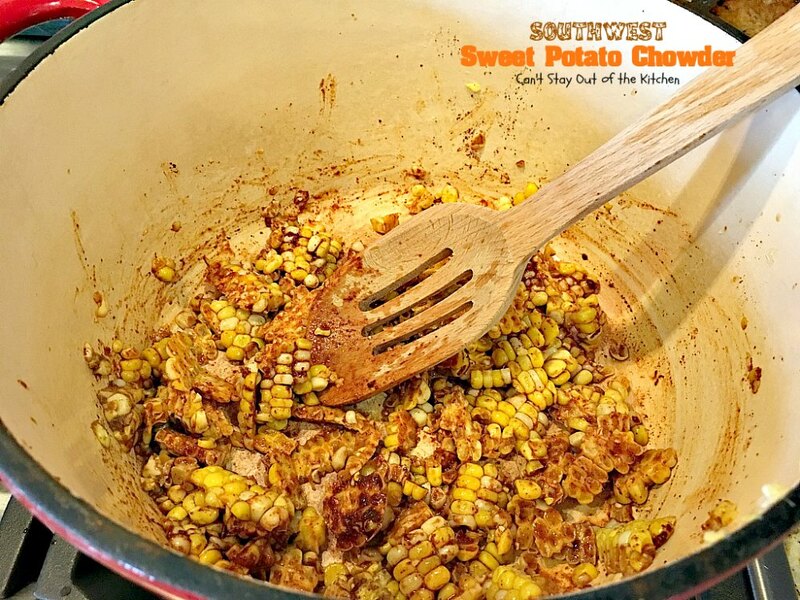 It’s so tasty and you can spice it up or remove some of the heat to your family’s preferences. You can also freeze half of it for later. 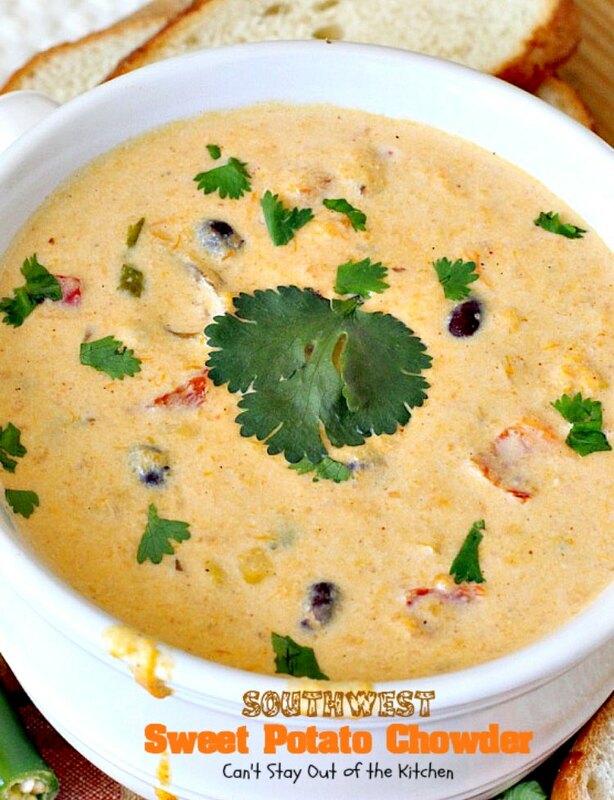 I loved this delicious Southwest Sweet Potato Chowder and I hope you and your family will enjoy it too. When I initially published this recipe in March 2013 I was still not using my Canon camera. Therefore the pictures were not as crisp as I would have liked. I recently remade this recipe (June 2016) for friends moving into a new home. Along with fresh fruit, Italian Seven Grain Bread, Heath Toffee Meltaways and some Healthy Gluten Free Banana Blueberry Muffins for breakfast, this was an easy main dish to make. They put it in the crockpot and had it later that day for their supper. This is one tasty soup. 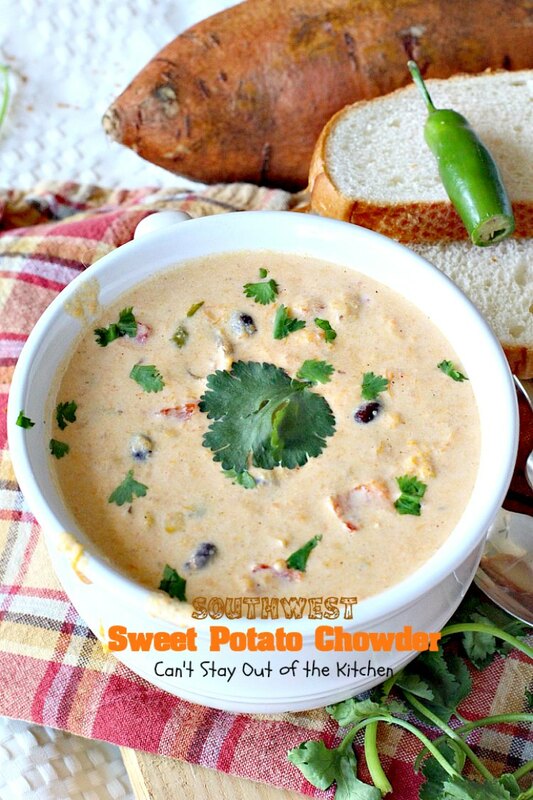 I hope you have a chance to give Southwest Sweet Potato Chowder a try. 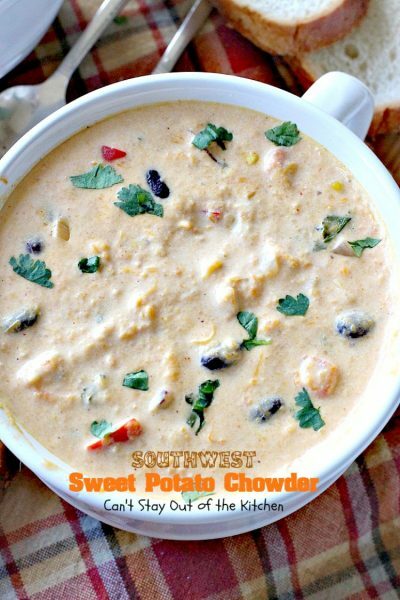 Southwest Sweet Potato Chowder is incredibly tasty. This recipe makes a lot. You can easily freeze half for later or eat it for lunches for a week like I did! I loved this tasty Southwest-style Sweet Potato Chowder. Serrano peppers add just enough kick to make this interesting. Garnish as desired. I added additional cilantro. I used these ingredients. Instead of kefir cheese and coconut milk, I used cream cheese and half-and-half this time. Bake sweet potatoes in the oven at 400 for about 1 to 1 1/2 hours. Since my sweet potatoes were so large, I had to bake them a little longer. Peel the potatoes and place in large mixing bowl. Mash down well with a potato masher. Add Kefir cheese – a yogurt cheese or cream cheese and continue mashing until incorporated. If you want a smoother texture, beat with an electric mixer. Meanwhile, in a skillet place frozen or fresh corn. Adding oil is completely up to you. A tablespoon of olive oil or coconut oil will prevent sticking. Add chili powder. If you’re not used to cooking with hot spices you may want to decrease the amounts. If you like your food hot and spicy you may want to increase it. This recipe does have quite a bit of heat to it (mostly from the serrano pepper). I added about a scant teaspoon of cumin. Add sea salt and pepper. Roast the corn for about 5-10 minutes over medium heat. I added half of a serrano pepper, sliced and seeds removed. This is going to add a lot of heat to the soup. 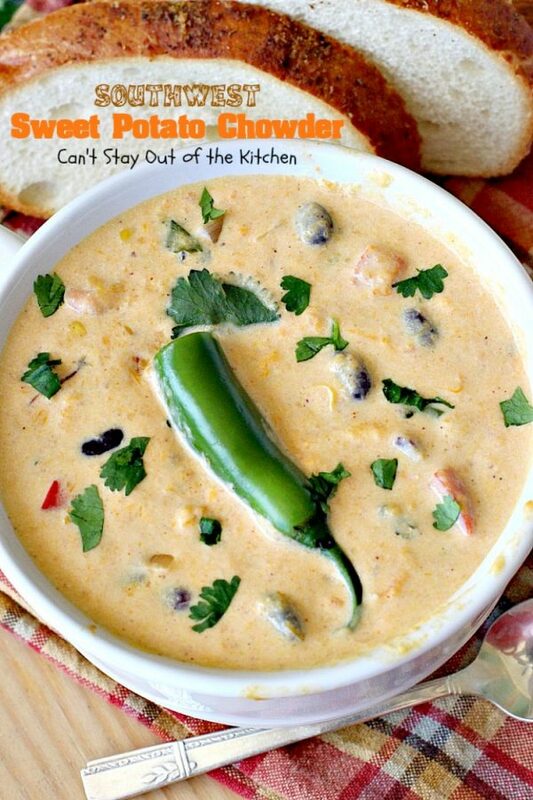 Substitute jalapeno, diced chilies, or other peppers as desired. Add diced green onions and diced red pepper. Add fresh cilantro and garlic. Stir to combine. Add black beans and sweet potatoes to the corn mixture. Whisk the sweet potato-black bean mixture into the corn mixture. Stir to combine. Add coconut milk, almond milk or half-and-half, as preferred. Stir to combine and heat through about 10-15 minutes. Don’t boil the soup, just heat it through. While this is a creamy soup it has a lot of texture from the veggies. To serve: Sprinkle with fresh cilantro. I thought Southwest Sweet Potato Chowder was awesome. Fried bacon pieces are another garnish you can add if desired. 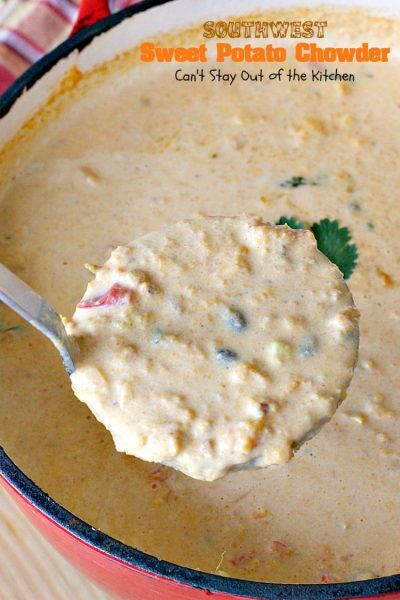 This is a great soup to make for company because it makes a lot and tastes delicious. 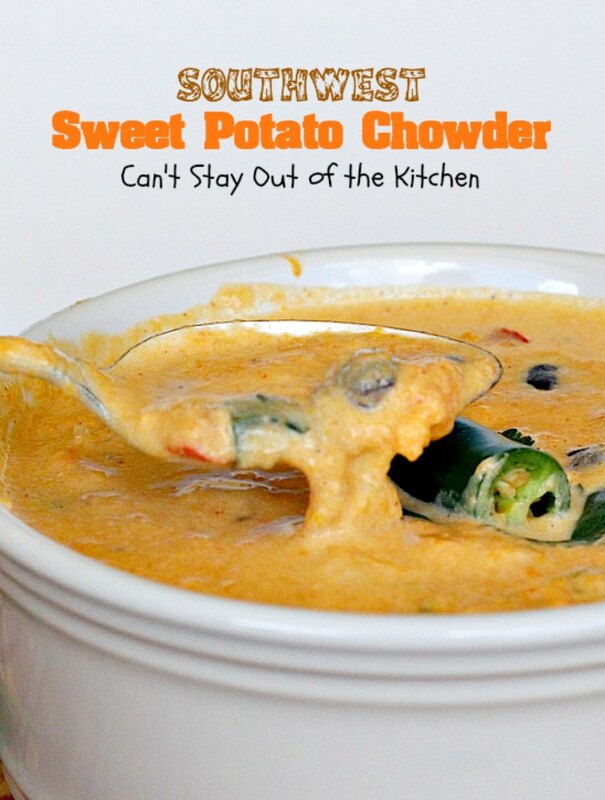 Wonderful tasting sweet potato soup with a southwestern flavor. This one uses black beans, corn, serrano pepper, cumin, cilantro and chili powder. Gluten free. Bake sweet potatoes in 400° oven until done. Mine took about 2 hours because they were very large. Set aside potatoes to cool a little, then peel. In a large Dutch oven place corn and roast with chili powder and cumin for about 5 minutes. Stir constantly so corn doesn’t stick. (You can add a little coconut oil to avoid sticking if you prefer). Add onion, red pepper, serrano pepper, salt, pepper, garlic, and cilantro. Continue sautéing until veggies are done. 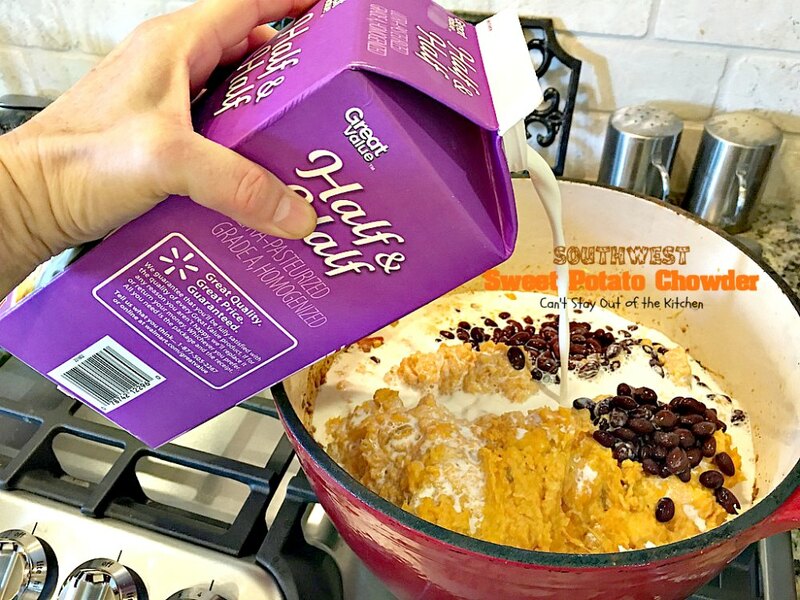 Add kefir cheese or cream cheese to sweet potatoes. Mash with a potato masher or beat with an electric mixer until smooth. 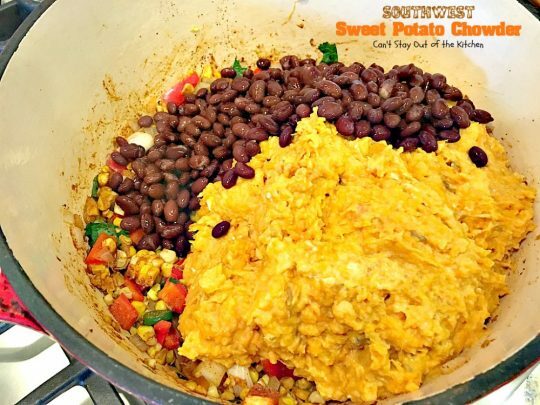 Stir sweet potatoes into corn mixture and add black beans. Slowly add coconut milk or cream into Dutch oven and heat over medium heat until cooked through. Ladle soup into bowls and garnish with fresh cilantro as desired. 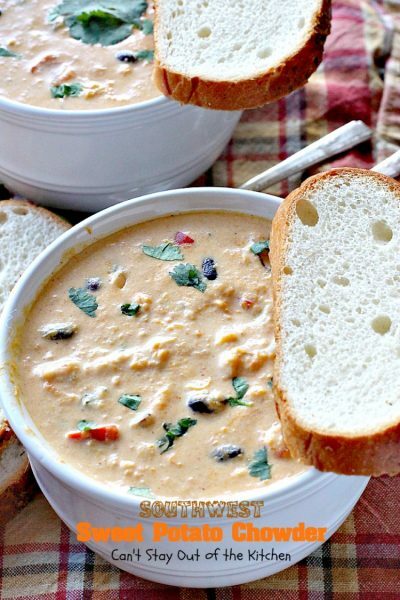 NOTE: You can garnish this soup with croutons or French bread, sprinkle with cheese and melt in oven about 10 minutes. OTHER OPTIONS: Add sliced leeks or salsa when sautéing the corn. NOTE: I used cream cheese and half-and-half when making this recipe, but I have used Kefir and coconut milk in the past. Both turn out quite well. 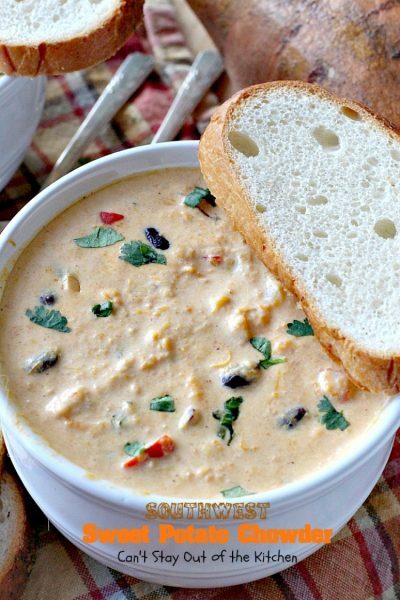 You can garnish this soup with croutons or French bread, sprinkle with cheese and melt in oven about 10 minutes. [br][br][b]OTHER OPTIONS:[/b] Add sliced leeks or salsa when sautéing the corn. [br][br]I used cream cheese and half-and-half when making this recipe, but I have used Kefir and coconut milk in the past. Both turn out quite well. Southwest Sweet Potato Chowder is hearty, satisfying and filling. Each bite of soup had a smooth texture from the sweet potatoes and a crunchy texture from the black beans and corn. It was heavenly. This healthy chowder is gluten free and delicious. Come over and join me for a bite! I was excited to make this dish this week–it looked so flavorful! I will say that the biggest annoyance was trying to navigate this page without a million pop-ups and things redirecting to other pages (winning an Amazon gift card, or being told my iphone or ipad was infected with a virus)…it was almost impossible to find the recipe page without going to my Windows desktop computer and getting it that way. Just wanted to let you know! Thanks so much, Jenn for letting me know. I’ll investigate this and find out what’s going on. When do I add the cheese? Not the cream cheese, but the actual cheese? Hi, Rachael, the cheddar cheese is added as a garnish, if desired. Great recipe but NOT with the Coconut Milk as a substitute. The coconut milk clashed too much with the southwest flavors. Hi, Amber. I used half-and-half the last time I made it and loved it that way. It’s such a good recipe, I hope you are able to give it another try. This sounds really good but what could you use instead of corn? And is there a sub for the kefir? You can substitute either plain Greek yogurt or sour cream for the kefir. I’m not sure of a good substitute for the corn. If you are allergic to it, leave it out. You might try something like garbanzo beans or diced carrots. I hope this helps. Great post. I like your page.